This Arts and Crafts bungalow is the home of a young family who moved from New York to Hillsborough for a more relaxed environment to compliment their high level, and sometimes stressful jobs in finance. These nature lovers wanted a highly functional home that was relaxing. We looked to the natural environment for inspiration. Copper and golden highlights balance the cool stone and concrete, while rustic wood was juxtaposed with modern forms. Wall treatments played a big roll throughout the house. 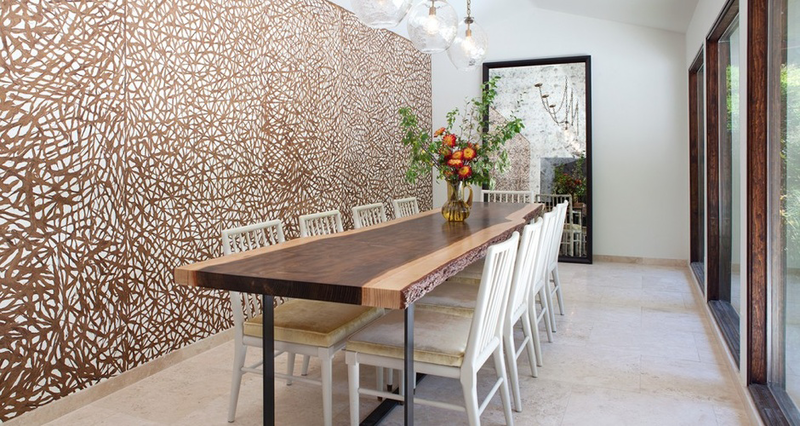 The dining room featured a natural bark wallpaper by Weitzner, the living room was accented with a wall of woven copper by Silk Dynasty, and venetian plaster adorned the walls of sitting room. Most of the light fixtures and furnishings were custom made by local artisans. Chandler Prewitt was the lead designer on this project while working under the direction of Geremia Design in Emeryville California.